For the rider who knows that they are going to spend long hours in the saddle through less than warm conditions, the ability to connect directly to the bike is key. Battery powered options are great, but they will not last for hours upon hours of open-road cruising. In that situation, if you are planning to take on some miles and make as few stops in between as possible, something from the Gyde 12V lineup is going to be your best choice. 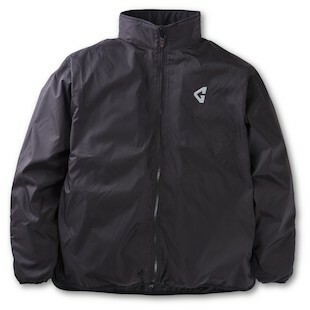 The Gyde by Gerbing 12V Heated Jacket Liner is the industry standard in on-the-bike heated gear. Powered by the signature Gerbing Microwire technology, the 12V heated liner can crank out the heat at the touch of a button. There are seven heating zones throughout the liner at the collar, chest (2), sleeves (2), and back (2), as well as pre-wired connections for ease of connection to a pair of 12V heated gloves. All of this is powered by the electrical output of your motorcycle itself through an advanced (yet simple to install) system that will continue to power your gear for as long as you are on the bike. 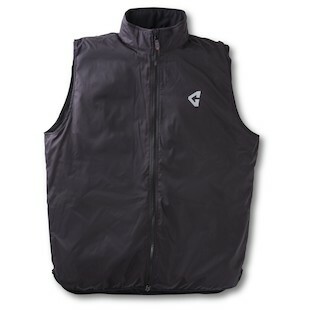 If the vest style is more your, well, style… the Gyde by Gerbing 12V Heated Vest Liner is another choice for which you could consider when the weather gets cold. Just like the full liner, the heated vest uses Microwire to heat you up at the flip of a switch. Simple as that. This liner is super sleek and meant to hug you snugly as a mid layer. As with the full liner, it also comes with a battery harness and fuse set that are simple to set up and create an easy, reliable connection to your bike. For the lower half of your body, the Gyde by Gerbing 12V Heated Pant Liner works in perfect symbiosis with the rest of the Gyde set up and can easily be joined to make a complete set. The 12V Heated Pant liners feature four heating zones at the let (2) and hips (2) that work within a durable ripstop nylon outer shell. Additionally, they are pre-wired for connection to any heated socks / insoles that you might want to add on as well. Gyde by Gerbing is an investment in fun. When winter comes, and you want to keep riding, they are here to make that a more enjoyable time. In essence, they add miles to your lifetime as they keep you in the driver's seat while others have called it a season.